It was a dark and blustery evening and, somewhere in the quiet world, a woman in the throes of PMS desperation went to her kitchen, looking for sustenance and comfort. Heh. Ok, I told myself I was looking for a sweet recipe to make for our next tea party. The truth is I was just craving something chocolatey, but none of my recipe books had anything that really made my bells chime. So I started improvising. This is the result, which I'm calling Bailey's Chocolate Chip Bars, or BCCB for short. In a small bowl combine oats, flour, baking soda, baking powder, and salt. In a large bowl, beat together butter, shortening, sugar, brown sugar and vanilla until creamy. Beat in eggs, one at a time, mixing well between each. Slowly beat in the flour mixture. Stir in the Bailey's and chocolate chips. Add chopped nuts if desired. Spoon about 2/3 of the mixture into the bottom of a small greased cake pan. In a small bowl, combine cream cheese, sour cream, Bailey's, sugar and vanilla. Mix until creamy. Layer this mixture into the cake pan. Add the remaining dough to the pan in small dollops. Don't worry about smoothing or filling in all the gaps. 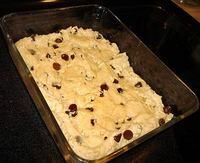 As it cooks, the dough will expand and fill in most of the spaces. Bake at 375° for about an hour. The top will be brown and crispy long before the center cooks, so about 30 minutes in, I covered the top with a layer of tin foil and reduced the heat to 350. Test by inserting toothpick, and if it comes out clean, it's done! Allow to cool and then slice into small bars and serve! For maximum cooking pleasure, enjoy a sip of Bailey's while you cook. Over ice, or splashed in the coffee cup. Yum! These would be great for afternoon tea, or for a special brunch or holiday treat, but I have to tell you, they're the perfect breakfast for the PMSing woman. Delish and Decadent. Thank you for this exelente recipe it looks so yummy from where i see it, i cant wait to make this very impressed thanks. Mmmm... These are so yummy! And got this site! Thanks! so, these lasted all of a day at my house, which is a new record. best idea EVER! Beautiful, just beautiful. Thank you for sharing this treasure! OMG, I think I just died and went to heaven. Just when I thought I had tried about every chocolate recipe out there, this one comes along. Thank you, I will print it out and make it in the near future.